They tend to be discovered through careless talk or they’re set up for assassination. But with the London Olympics not far away, there’s a new kind of tout on the block. The ticket tout. He’s shown his face this past couple of weeks offering big money for tickets to the Champions League final [European Cup from this point on] at Wembley. I have a friend in England who told me two weeks ago – when we were at Blackburn to celebrate United winning their 19th league championship – that he had been offered £2,000 for two tickets that cost him £220 each. 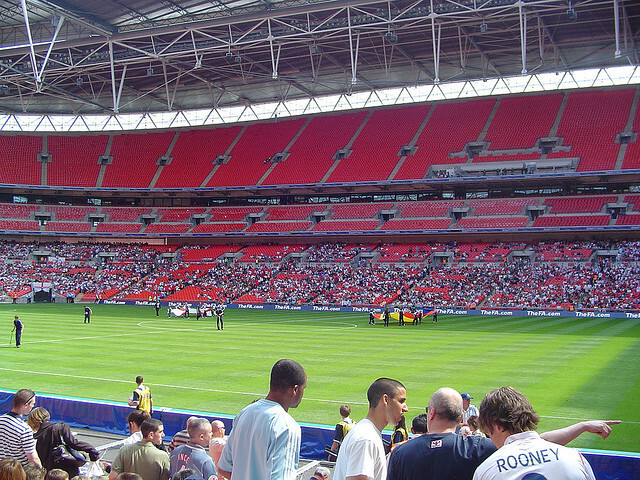 There’s one blagger on the internet seeking to sell his Wembley ticket to the United –v- Barcelona game for £7,000!! I’m still recovering from the financial mess of 1999 in Baraclona…but £7,000? Who would even if they could? It’s simply outrageous. Seven thousand pounds would pay the university fees for those fortunate enough to find a ‘uni’ selling its wares at less that the £9,000 maximum allowed nowadays by Government. Now, nobody really minds ticket touts. We have all used them. That’s sometimes the only way we get tickets for games. Or for the theatre. In fact, that Blackburn game I know tickets with a face value of £37 were sold for £60. I know because I bought one. When United made it to the final in Barcelona in 1999, a group of about seven (like most of the week in Catalyunia I can’t remember exactly how many) of us went to Camp Nou without tickets. Well, we left for the airport immediatley after the FA Cup final on the Saturday (remember United won 2-0 against Newcastle United) to secure the second leg of The Treble. We were staying in Blanes, about an hour outside Barca going north. We were there for a cheap package holiday…a week’s accommodation beside a bar run by a Scottish family. We agreed we would travel by train to Barcelona. We then got a taxi to Camp Nou (not Nou Camp, according to our taxi driver) on the Monday to see if we could buy tickets. No one would pay more than £250 for a ticket. At least that’s what we said as we began walking around the magnificent stadium. We all said we’d stand outside the stadium and listen rather than pay over the odds! In the event, me and my son Steven stepped outside the £250 limit. We just couldn’t countenance ourselves standing outside the ground listening to the racket inside. So instead, we contributed to the racket going on outside the ground where Barca supporters and season ticket holders were in possession of tickets and were prepared to sell them. No one made us. We just had to admit defeat…that our desire to see the game outweighed common sense. We met with our ticket source again. Handed over the cash and took the two tickets. And all this after the tour operator’s staff in Blanes warned against buying tickets as there were scams going in around the stadium. But the desire to see the game and the love on everything United ignored the warnings. We just had to get into the game. And so we paid well over the odds, took the chance and finally got into the ground to witness history. But there’s a different type of tout today. There’s the corporate hospitality tout (you know, the prawn sandwich brigade as Keano once put it so ellequoently). They have to be catered for. The corporate customer never watches football but has to be at the World Cup Final. Or the European Cup Final or the final of the track events at the Olympics. His greed and avarice are well matched. This season I’m not making the effort to go to Wembley…too old with arthritis of the right hip and a shrunken wallet…the Big House on the Ormeau Road in Belfast will suit fine. No prawn sandwiches…but a pint and a burger for a fiver (£5)! But as I was saying, the greed and avarice of Mr Corporate Hospitality will make sure the touts earn their money…and this is where it all goes wrong. An example of where it goes pear-shaped is the corporate greed of the touts that sell/supply corporate packages for the likes of the Olympics for the World Cup football finals. What’s often very bloody annoying about these big events is that we, the punters, cannot get our hands on tickets until virtually the day of the event we want to see. And yet the corporate deals that are offered sometimes years in advance. Right now there are corporate deals being offered for the London Olympics. And yet the allocation of tickets, we are told, has not yet taken place. Ordinary punters put their applications in for tickets months and months ago. Money will have been removed from their credit/debit card accounts in the past few weeks. But they do not yet know what events they have tickets for! Naturally they have specified events they are keen to see. But they do not yet have any clue as to what events they have been lucky to obtain tickets for. They may have wanted tickets for one of the finals of the big athletics events…but they may find when they open their package from the London Olympics ticketing team that they have front row seats for archery. And guess what? Yeah, we…that is the Irish…will have a hand to play in the dirty dealing London ’12 Olympics tickets scandal. Mark my words….and watch this space. PS for those who did manage to get a ticket to Saturdays champions league final, it doesn’t matter how they got their hands on it, the result will have remained the same. Beaten by a better team, but Manchester United will be back.